More British Muslims should be recruited into the UK’s armed forces, one of Britain’s highest-ranking soldiers has said. Muslim Public Affairs Committee UK blamed the poor uptake on the community’s ‘demonization’ and Britain’s ‘unethical’ foreign policy. General Sir Nicholas Carter, Chief of the General Staff, admitted that the number of ethnic minorities in the army was “nowhere near where it needs to be,” particularly in relation to religious minority groups such as Muslims. 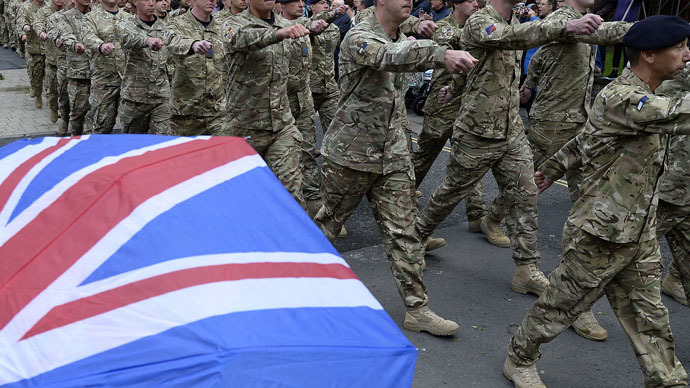 Figures released by the Ministry of Defence (MoD) showed only 0.54 percent of regular soldiers identified as ‘Muslim’ – with many coming from commonwealth countries, rather the UK. Ethnic minorities are generally unrepresented, with non-white ethnic groups making up less than 10 percent of the British military – around 9,100 of the 88,500 troops in the regular forces. “We have to do more. My highest priority is ensuring we continue to have the best possible talent throughout our army,” General Carter said. In contrast to the MoD figures, it’s estimated that twice as many Muslims have traveled to Syria to fight with Islamist jihadist groups than have joined the British Army. Carter said there was a ‘common ground’ between the values of the British Army and minority communities, which could be used to recruit new soldiers. “The Army has always played an important role in making the connection to all elements of society and there are plenty of examples of initiatives that have built enduring relationships with minority communities,” General Carter added. The Army has tried to broaden its recruitment base using Muslim officers who could speak to communities, as well as trying to attract minority groups into subsidized technical and engineering programs. The Armed Forces Muslim Forum was also launched as a way of fostering ties between the British Army and Muslim communities. “Myths need to be dispelled and more ethnic minorities should be encouraged to look at careers in our Regular Army, Army Reserve and at volunteering opportunities with the Army Cadets,” an unnamed British Army source told the MailOnline. The statements follow comments made by an Imam working in the British Army, who said there was no contradiction between being a soldier and a Muslim. However, some British Muslims have expressed reservations about such efforts, especially as British forces conduct further activity in Muslim majority countries. “You will never find Muslims flocking to join the British Army, and it is for one very simple reason – they don't want the blood of innocent people on their hands,” Raza Nadim from the Muslim Public Affairs Committee UK (MPACUK) told RT. Nadim also told RT that Muslims were naturally hesitant about joining the British army because of the “demonization of Muslims in many media outlets” and “politicians stoking up tensions in our society,” which would naturally alienate them from British institutions. “If the British Army wants to recruit more Muslims it only needs to do one simple thing – stand for ethical reasons – only then will it be seen as being compatible with a Muslim's faith,” Nadim added.